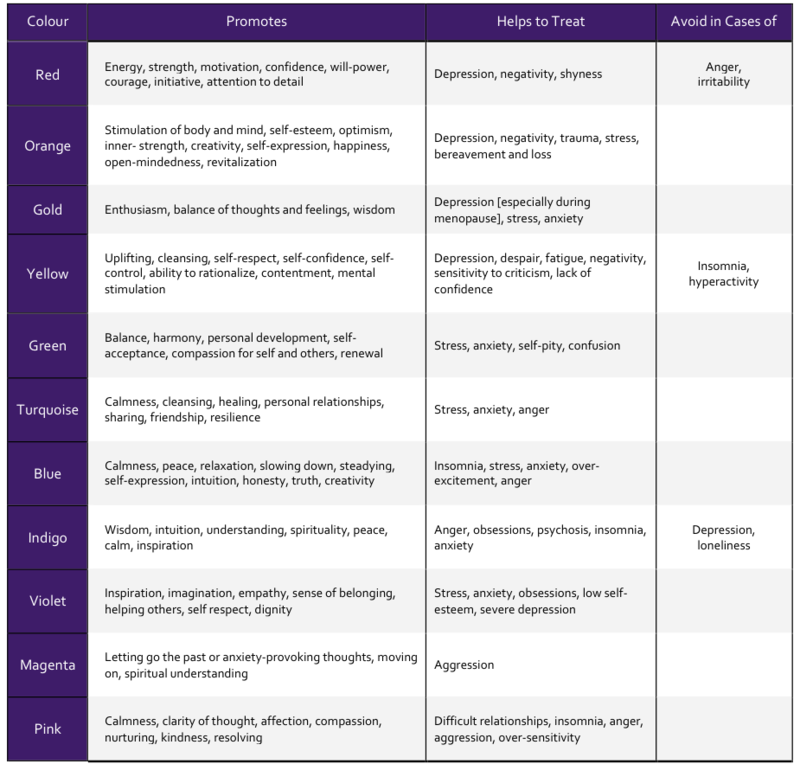 Colour therapy is a set of methods for using colours to help cure diseases. With a long history in the annals of complementary and alternative medicine, the 'colour cure' was a popular treatment for mental illness at the turn of the 20th century. "Patients with acute mania were put in black rooms, patients with melancholia in red rooms; blue and green rooms for the boisterous, and a white room for the person who is practically well." - Use Colors to Cure Insane, New York Times, October 26, 1902. While there is little scientific evidence that the various colour-based therapies can cure any particular diseases, the psychology of colour has long been recognised as an important psychological factor in architecture and interior design: colours can evoke spontaneous emotional reactions that can affect mood and stress. This may in turn exert influence mental wellbeing, an effect that is particularly relevant to designers of the interior and exterior built environment. The impact of colour on how we feel has been explored by architects and designers in all sorts of contexts, from increasing office productivity to improving wellbeing. The colour red is generally said to be associated with an increase in appetite, reduced depression and increased angry feelings, purple with boosting creativity and developing problem-solving skills, orange with optimism, blue with a sense of security and productivity, and green with a sense of harmony and effective decision-making. The potential effects extend beyond single colours: a monotonous colourscape may be associated with irritability and negative ruminations, while highly saturated, intense colour patterns may increase stress. An interesting blog by Parkin Architects discusses the opportunities for colour to exert mental health impact in healthcare facility design, again pointing to certain colours that, in addition to helping eliminate the 'institutional look' of facilities, might exert specific impacts on mental health. Rigorous scientific research on the specific impact of colours on mental health is in its infancy. TheFarthing boutique has developed a new infographic that reflects current ideas on the psychology behind the use of different colours to impact responses in various designed environments. Their sharing this infographic with us reminds us that harnessing the use of colour in urban design to promote good mental health is an interesting field that may have potential, warranting further scientific exploration. This post was written by Layla McCay, Director of the Centre for Urban Design and Mental Health, in response to a new infographic developed and shared by Toby Dean and Jessica Morgan of TheFarthing. World Health Day was on Friday April 7th, and since the World Health Organization designated this year's theme 'depression: let's talk', we had an impromptu urban design and mental health social media flashmob so that architects, planners, citymakers and others could talk about our role in preventing depression. Using the hashtags #udmhflashmob and #designagainstdepression, people and organizations from around the world came together and shared interesting, important and fun ideas and experiences around leveraging urban design to help prevent depression. Using hashtag analytics, #udmhflashmob reached 1 million people during World Health Day, the majority of whom were in the US, Australia, the UK and Japan, while #designagainstdepression reached 593,000 people - and counting. Did you miss it? Join in the fun: here's some of our posts. You can keep up the fun with the #DesignAgainstDepression hashtag anytime. And keep a look out for the next #udmhflashmob - a fun way to raise awareness and share great design, research, policy, and initiatives. Friday 7th April is World Health Day, and this year the World Health Organization has announced the theme, which is depression: let's talk. Depression is the leading cause of ill health and disability worldwide. More than 300 million people are now living with depression, an increase of more than 18% between 2005 and 2015. People who live in cities have up to 39% increased risk of depression. This is important for architects, city planners, and other urban designers. So, in line with the World Health Day theme, #letstalk about #designagainstdepression. Depression is an illness characterized by persistent sadness and a loss of interest in activities that you normally enjoy, accompanied by an inability to carry out daily activities, for at least two weeks. In addition, people with depression normally have several of the following symptoms: a loss of energy; a change in appetite; sleeping more or less; anxiety; reduced concentration; indecisiveness; restlessness; feelings of worthlessness, guilt, or hopelessness; and thoughts of self-harm or suicide. What does urban living have to do with depression? Pre-existing risk factors: Some of the reasons for people moving to the city also happen to be risk factors for depression: for example, poverty, unemployment, homelessness, existing physical and mental health problems, previous trauma, personal crises, family break up, addiction, and immigration. This leads to a population who are particularly vulnerable to depression. Social factors: People with many of these pre-existing risk factors often encounter negative disparities in the city, such as physical and psychological segregation into neighborhoods characterized by poverty and social challenges, engendering feelings of injustice and hopelessness, and experiences of prejudice and discrimination that may affect mental health. Environmental factors: The urban setting can affect people in two key ways: increasing stimuli, and stripping away of protective factors. Overload: People who live in the city experience an increased stimulus level: density, crowding, noise, smells, sights, disarray, pollution and intensity of other inputs. Every part of the urban environment is deliberately designed to assert meanings and messages. These stimuli trigger action and thought on a latent level of awareness, and become more potent as an inability to ‘cope’ sets in. This can have the effect of overload: increasing the body's baseline levels of arousal, stress, and preparedness, but also driving people to seek relief: quiet, private spaces; over time this urge may evolve into social isolation associated with depression and anxiety, and also forms the basis of the ecological hypothesis of schizophrenia. Erosion of protective factors: People who live in the city may find that they have less access to the factors that are protective for good mental health compared to those in rural areas. For example, they may have diminished access to nature, fewer opportunities to integrate exercise as part of their daily routines, and reduced leisure time as increased time is spent at work and commuting around the city. People may find themselves feeling unsafe, having less privacy, and even less sleep, due to factors like crowding, light, noise and stress. Rural to urban migration often sees people leaving behind their strong social networks of friends and family, and it takes time to develop similarly supportive social capital in the city. This may particularly be the case as urban dwellers may be reluctant to engage in social interactions, to avoid overstimulation, due to safety concerns, or because of the reduced likelihood of future relationships with each individual they encounter. As these protective factors erode, people become more vulnerable to developing mental health problems. So how can urban design help reduce the risk of depression for people living in cities? Design green space into the city: There are important relationships between accessible green spaces and mental health and wellbeing. Access to natural settings in neighbourhoods and in the course of people’s daily routines is likely to improve and maintain mood, and help prevent depression. Design active space into the city: Regular exercise is as effective as anti-depressants for treating mild-moderate depression, and a key opportunity for promoting good mental health. Action opportunities can be embedded into people's routines as they move around the city, from improving walkability and bikability infrastructure to traffic calming, reliable public transport, and access to exercise facilities in the city for all. Design pro-social space into the city: One of the most important opportunities for preventing depression is natural, positive social interactions, from close, confiding relationships to feeling part of a community. Urban places should facilitate social interaction (while also ensuring opportunities for privacy to avoid overload), eg. compact, walkable neighbourhoods with street benches on which to rest, mixed-land use with welcoming shopfronts and amenities, fine-grain street fronts (long, monotonous blocks of featureless walls can make people prone to ruminations), and multi-use public open spaces where people can get together for cooperative community events with opportunities for participation and volunteering. Design to improve sleep: Sleep is one of the most important protective factors against depression. And yet cities can erode sleep patterns with increased ambient noise, light pollution, and crowding. Sirens, alarms, vehicle traffic noise, noises from adjacent homes, and construction work may all be more likely in the city, and urban residents are more likely to sleep at times that do not match with their biological clock. Good building insulation, street trees, walls, and other noise barriers can help prevent urban noise from disrupting sleep, as can traffic restrictions. Street lighting can be oriented downwards to reduce residential light pollution. Design for safety: A sense of safety and security is integral to people’s mental health and wellbeing. People are deterred from taking advantage of green, active and pro-social opportunities in the city if they fear for their safety. Whether fear of crime, traffic, or getting lost (for example for people with dementia), improving safety can increase people's access to these opportunities. Learn more detail about these opportunities on our website. ACTION: What can I do today? Take pictures of places in your city or share your firm's work encapsulating some of the design elements that help #designagainstdepression (click here for more info). Upload to Twitter (tag @urbandesignmh) and/or Instagram (tag @urbandesignmentalhealth). State the city, the design features of interest, and use the hashtags: #worldhealthday #udmhflashmob and even #designagainstdepression Bonus: you'll get some air, exercise, and walk around green spaces while you take the pictures, improving your own mental health while you do this. Follow the hashtags, look at everyone's photos, comment, learn and be inspired about how you can integrate mental health promotion into your projects. While the whole world is talking about depression for World Health Day, let's make sure they think about the important and innovative roles that designers and other citymakers can play in preventing depression and promoting better mental health and wellbeing for the population. Cherry blossom season is upon us in Japan. The national news is filled with cherry blossom reports: it feels like everybody is invested in the specific day that the flowers will bloom in their town. There is good reason for this interest, and not just the national appreciation of beauty, flowers and the ephemeral nature of life. Cherry blossom behavior is part of Japan’s national psyche. In a unique moment of nationwide celebration, the country’s usual work-focused culture presses pause, and a different priority is embraced: cherry blossoms viewing, known as hanami. People walk amongst cherry blossoms, admire them, photograph them… Admiring cherry blossoms is part of the pulse of Japan. As the flowers fleetingly blossom, so too does another fleeting pleasure: leisurely outdoor social interaction. Everyone dashes to their nearest cherry blossom location to enjoy raucous, convivial, drunken hanami parties, crowded on blue tarpaulin sheets spread under the trees. Offices, universities, friends, and just about anyone else organises hanami parties, characterised by picnicking (with copious alcohol usually involved). Office workers are even sent to the park early in the morning to secure a good spot. Hanami picnics in Yoyogi Park. Photo by Stardog Champion. Used Under Creative Commons license. But as the blossoms start to fade, so too does this particular form of social interaction. At the end of cherry blossom season, Japanese people pack up their picnic blankets and store them til next spring. This seems a missed opportunity: many people live in very small homes, particularly those in large cities like Tokyo, which inhibits their inviting others to their homes for socialising. Picnics should be an ideal solution. And yet they are not. Part of the reason may be lack of venue. Tokyo has only 5.4 m2 of green space per person; this compares to 11.8m2 in Paris, 26.9m2 in London and 29.1 m2 in New York. While picnicking takes over many public spaces during hanami season, for the rest of the time this is not appropriate, and many parks are designed to be admired, not as appropriate social dining spots for adults. But finding the right venue is not the only hurdle. Picnics do not tend to be part of Japanese culture. According to many Japanese people, picnicking outside at any non-hanami time of the year is generally considered 'bizarre', 'childish', and even 'suspicious'. Hiroshi Ota, an architect, and Kaori Ito, an urban designer, helped establish the Tokyo Picnic Club in 2002. Its mission: to tempt Tokyoites to picnic outside of hanami season, socialising in natural settings year-round. They claim: ‘to picnic is the urban culture to utilize the public spaces, to make up for the deficiencies of our city life.’ The appreciation of parks is a cultural norm, but the idea of picnics is unusual. Yet they offer many benefits, not least the opportunity to promote good mental health in the city. Picnicking offers exposure to natural green spaces, encourages physical activity (at least walking to the picnic spot), and facilitates pro-social interaction, which are all urban factors associated with good mental health. But their enthusiasm for picnics is not shared by everyone. The Tokyo Picnic Club described setting up picnics in various patches of green space around Tokyo – and measuring how long it took before their party caught the attention of the police and were reprimanded for their subversive attitude to picnicking outside the social boundaries of hanami season. It rarely takes long before they are questioned - and often asked to move on. The Tokyo Picnic Club hopes that by raising awareness, the value of year-round picnicking will be better understood and appreciated in Japan. Their efforts have included portable lawns, and Grass on Vacation, an art show where they remove aeroplane-shaped pieces of turf from locations where people do not sit on the grass, and take them on ‘vacation’ to other locations where the grass can 'enjoy' its intended use: people are encouraged to sit, lie, socialise, eat and generally enjoy the experience of nature in the city. The Tokyo Picnic Club smilingly insist that the "Right to Picnic" should be a basic human right for urban dwellers. Given the normality of picnicking in other cities all over the world, in Tokyo, this is a surprisingly subversive demand. In time, the Picnic Club hope for proper observation of one of the 15 rules of Tokyo Picnic Club: every day is a picnic day. By encouraging people’s access to green space and positive, natural social interaction, this is also an apt mantra for mental health promotion in the city. Layla McCay is Director of the Centre for Urban Design and Mental Health. A psychiatrist, international public health and health systems specialist, she holds academic positions at Georgetown University (US), London School of Hygiene and Tropical Medicine (UK) and Tokyo Medical and Dental University (Japan).